A pump is a liquid transporting machine that converts the mechanical energy of a prime mover into the mechanical energy of a liquid. Marine pumps refer to all kinds of pumps for use by ships that meet the requirements of ship specifications and technical conditions. On board, they are often used to transport various liquids such as sea water, fresh water, sewage, lubricating oil and fuel oil. In order to achieve this goal, it is necessary to increase the pressure energy and potential energy of the transported liquid, or to overcome the resistance of the liquid flowing in the pipeline. 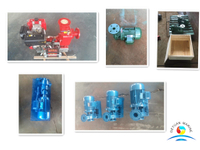 Therefore, in essence, the pump is used to improve the mechanical energy of the liquid. There are many applications of pumps in ship systems, such as ballast pumps, bilge pumps, fire pumps, daily water pumps, cargo oil pumps for transporting other liquids, etc. The marine generator has a wide range of application in tug, yachts, ferry, patrol boat, dredging and offshore etc. normally, a generator set will consist of the engine, alternator and control system. we China Deyuan Marine can supply many types of generator set, the power range from 20KW up to 1800KW, the brand of engine we mainly supply Cummins, Yuchai, DEUTZ, MWM, Volve, Perkins etc, the brand of alternator we offer famous brand, such as Marathon, Stamford, if customer has special brand required, we can also satisfy.